May 5th is Children’s Day in Japan. Originally, and when I was growing up, the fifth day of the fifth month was Boy’s Day and March 3rd, or the third day of the third month was Girl’s Day. Now May 5th is a national holiday, combining both girls and boys to celebrate their health, growth and happiness. But in reality, many still celebrate the days separately. Being Japanese-American, I accepted Japanese culture the way it was presented to us and never bothered to ask questions. But, now that I’m older, I want to know why and how these things came about. The internet does a wonderful job to find general information but I am lucky to be surrounded by wonderful teachers who have first hand knowledge and are happy to pass this down. Children’s Day is called Kodomo no Hi – Kodomo means children Hi means day no is a particle. Originally this day was called Tango no Sekku, which I have no idea what it means nor where it comes from and the characters don’t represent anything related to children, so I asked my teacher. My sensei, teacher, said Tango came from the Chinese language and Chinese calendar – so I may have to ask my Chinese master to see what he knows when he gets back from China. In Japan, the festivities around Children’s Day centers on the wish for boys to be healthy and strong. Similar to many Asian cultures, symbolism plays a large role. Outside the home the koinobori, or carp streamers are displayed on a tall pole to signify there is a boy or boys in the home. The black carp represents the father, the red the mother and the smaller carp underneath are the number of boys in the home. According to Chinese folklore, a carp swam upstream and became a dragon, thus the carp, or koi in Japanese, symbolizes strength. In the country side, during this time of year, it is beautiful sight to see many koinobori swimming against the blue sky. 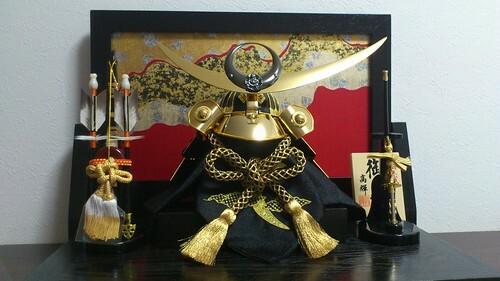 Now, inside the homes, many display ancient traditional warrior dolls and warrior helmets, called go gatsu ningyo, which literally means fifth month doll or May dolls. Again, this is symbolism in action. The sweet they enjoy during Children’s Day is called kashiwa mochi. The bean paste filled mochi or rice cake is wrapped with a kashiwa or oak leaf. The oak leaf in Japan is known as, “mushi ga tsukanai” which means it is said to repel insects and therefore considered “strong” or “tough”. Another tradition uses a species of the iris flower called “shobu”. The word shobu means a match or fight between opponents, and because of it’s homonym, the iris flower is hung under the eaves of the home and it’s leaves are added to the soaking bath water – it is believed that with respect to martial arts, the leaves will drive away evil spirits. The petals of the shobu iris are enjoyed in a cup of sake, so not only do the children have fun, so do the adults! Its interesting to see how many of the festivity practices, from décor to food, are based on symbolism. And this can be seen in many Asian cultures not only Japan. So, how can you celebrate Children’s Day if you don’t live in Japan and have no access to those items mentioned above? That has been my dilemma for many years and I have had to be creative and make do with what was available. Here are some of my tips. In Japan, they make an origami kabuto or warrior helmet out of newspaper and why not add a newspaper sword. How to make an origami kabuto hat and sword and from Newspaper. The sword is just stacks of tightly rolled newspaper that has been taped together. Although, I am not a fan of weapons and never bought toy guns when they were little, I have learned that a child will use anything, from sticks to kitchen gadgets, and transforms it into a weapon. So, I figured a newspaper sword was harmless. And just to add, they received many toy guns as gifts and later on water pistols were a favorite. Now, what type of food to prepare? My logic was, it was their day, so I will cook foods that they love. Now, I think back and should have had something special that represented strength, health and growth. Another traditional food that the Japanese eat during Children’s Day is chimaki, or rice wrapped in bamboo leaves. Bamboo also symbolizes growth and strength. You can make a simple dish, such as bamboo rice, using bamboo shoots as the bamboo can version is readily available everywhere. Please note: this recipe is for an electric rice cooker. 1 8oz. 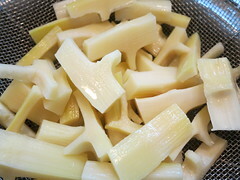 canned bamboo shoots – drained and sliced thin into bite sized pieces – if fresh is available, please use fresh! Wash rice, drain water. In rice cooker pot, add a cup of clean water, add soy sauce, dashi, sake and mirin. Add more water so the water line is underneath the 3 cups mark. Stir gently. Add the bamboo shoots on top of rice and cook rice the usual way. Let sit for 10 minutes before mixing and serving. The taste is very mild, so don’t be shocked. Hope you can celebrate Children’s Day where ever you are and create your own traditions for your family. Wishing all children good health and a happy spirit! Happy Children’s Day! Thanks for stopping by. How was growing up in Fukuoka? Were you the only American in the class? I’d love it if you would share an article about your experiences growing up in the Japanese countryside – That would be so interesting! I have to find out more about Tango no Sekku. I’m so happy I stumbled across your blog! I am hapa (half Japanese) from Hawaii and my husband (who lived in Osaka for 2 yrs) and I have four sons! I’m so excited to celebrate boys day this year! Mahalo for the great info and I look forward to reading more of your blog! Happy you found me! Hope you are able to find things you didn’t know about Japan and please do subscribe!